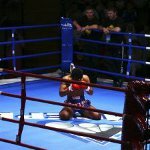 March 17 is National Muay Thai Day, also known as Nai Khanomtom Day, in Thailand. This holiday celebrates the national sport of Thailand. Muay Thai, also referred to as Thai boxing, is a combat sport of Thailand. The first codified rules for Muay Thay were published in the early 20th century, but its predecessor, Muay Boran, emerged much earlier. According to legend, in 1774 the Burmese King wanted to see how Thai boxing Muay Boran would compare to the Burmese boxing Lethwei. Thai captive Nai Khanomtom defeated ten Burmese champions. The King was so impressed with his skills, that he granted Nai Khanomtom freedom. When Nai Khanomtom returned to Siam (now Thailand), he was regarded as a hero who made Thai boxing famous. Muay Thai is the modern form of Muay Boran. It became widespread internationally in the 20th century. In 1995, the Royal Thai Government set up the World Muay Thai Council, the professional sport governing body of Muay Thai. This sport is practiced not only by Muay Thai masters, but also by mixed martial artists who consider it an effective striking base.